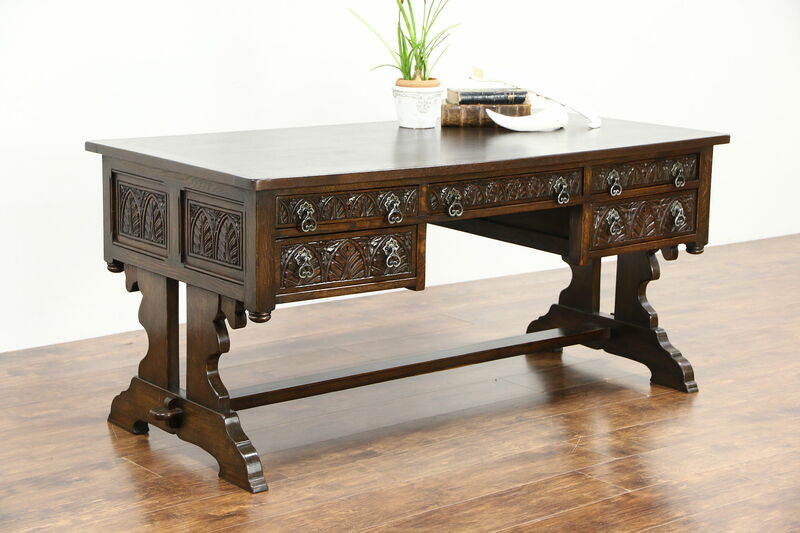 A solid oak writing desk was hand carved in Sweden about 1910 in the Renaissance manner. The top has an inlaid parquetry pattern and has been revarnished for durability. There is a slight sag from age, see photos. The original finish on the base is very well preserved, waxed and buffed so all that is needed to maintain the antique patina is an occasional wipe with a soft dry cloth. Drawers have hand cut dovetail joints and wrought iron pulls. The trestle base has mortise and tenon joints on this historic library furniture. Measurements are 68" long, 32" wide, 30 1/2" tall and legroom is 24" underneath.